Donna Griffin writes: This house belonged to my Papa and Granny (James and Josephine Royal). They raised their 9 children here. Mama (Dorothy Grimsley) inherited this homeplace (28 acres + the 1 acre ajoining with the brick home & tobacco barn). The precinct house sits on this property. 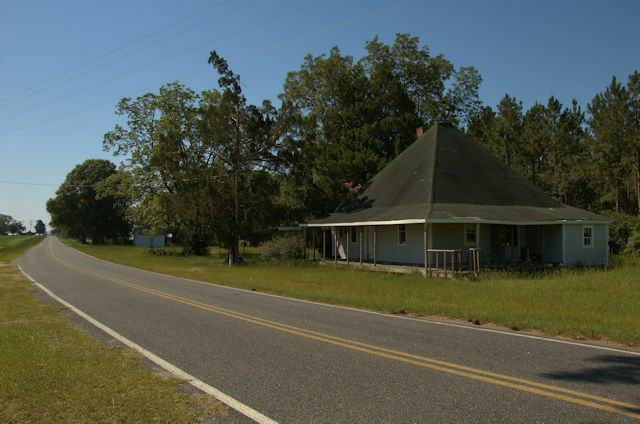 After mama’s death in 2001, daddy (Pat Grimsley) called himself caretaker of the land. Daddy passed away last year – October 2011. My brother, sister and I inherited the property and homes equally and my husband and I were privileged to purchase this property in June 2012. Thank you for appreciating and posting this home. I have my most fondest memories of childhood here – spending so much time on the front porch, which was screened in and only on the front of the house then… papa’s pipe, granny’s watermelon, Lawrence Welk and Little House on the Prarie… pickin’ peas, digging potatoes – climbing that cedar tree and day dreaming on the lower limb – entertained for hours. As the oldest of 17 1st cousins I was the first grandchild to experience this wonderful place – but everyone after me, loved it too. It had a heartbeat and it loved us. 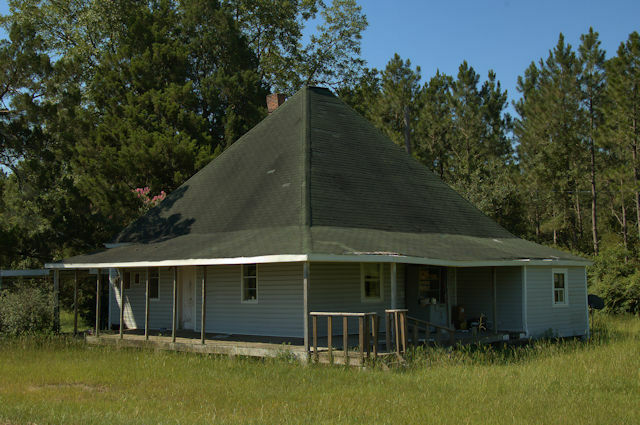 The house is located in Frank, a small farm community outside Ocilla. As far as I can tell it never even had a post office, but in the early 20th century it had a school, as well as a church which remains today. A voting precinct has also been located here for many years. I wish I knew more of the history. The house I’m featuring in these images has the most extreme pyramidal roof of any in the area, although it’s been updated with vinyl siding and modern shingles. It was the home of James and Josephine Royal . Thanks to Tonya Brown Grimsley for the intial identification.